The income of all functioning national parks in the island has shown a sharp increase this year, a spokesperson for the Wildlife Conservation Department (WCD) told the Daily News yesterday. She said the peaceful environment in the country, and improving tourism sectors have led to this achievement. She said a record income has been made in Galoya, Kumana, Maduru Oya and Lahugala national parks this year compared with the statistics of past years. She noted the income of Galoya and Kumana national parks has been trebled compared with last year. She said about 20 national parks among the 22 national parks gazetted in the country are now functioning except Somawathiya and Ussangoda. The spokesperson noted there is a marked increase in the number of foreign visitors to these parks. She said the department has planned to commence issuing tickets at the Somawathiya National Park by next year. 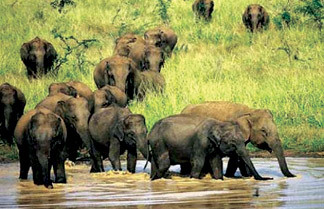 The gazetted national parks in Sri Lanka include Yala, Wilpattu, Galoya, Kumana, Udawalawe, Lahugala, Maduru Oya, Wasgamuwa, Flood Plains, Somawathiya, Horton Plains, Bundala, Lunugamvehera, Minneriya, Kaudulla, Hikkaduwa, Pigeon Island, Horagolla, Galway's Land, Angammedilla, Ussangoda and Mulathivu National Parks.